We’ve been hearing people pronounce the death of DVD and Blu-ray for years now. You’d never know it from the astonishing wealth of Blu-ray debuts, restored movies, and lovingly-produced special editions in 2016. The sales numbers are way down from a decade ago, of course, thanks in large part to the demise of the video store, which drove sales of new movies to fill the new release rental racks. The studios still handle their own new releases on disc but many of them have licensed out their back catalog to smaller labels—some new, some longtime players—who have continued to nurture the market for classics, cult films, collectibles, and other films from our recent and distant past. Criterion, Kino Lorber, Shout! Factory / Scream Factory, Twilight Time, Arrow, Olive, Blue Underground, Flicker Alley, Raro, MVD, Cinelicious, and others have continued to reach those of us who value quality and deliver releases that, if anything, continue to improve. We prefer to own rather than rely on compromised quality of streaming video and the vagaries of licensing and contracts when it comes to movies. 2016 has been as good a year as any I’ve covered in my years as a home video columnist and paring my list of top releases down to 10 was no easy task. In fact, I supplemented it with over two dozen bonus picks and honorable mentions. My approach is a mix of historical importance, aesthetic judgment, quality of presentation, and difficulty of effort. It is an unquantifiable formula influenced by my own subjective values but you’ll see some themes emerge. I favor films that have never been available in the U.S. before, significant restorations, discoveries, and rarities. But I also value a beautiful transfer, well-produced supplements, insightful interviews and essays, and intelligently-curated archival extras. You’ll see all these in the picks below. 1 – Out 1 (Kino Lorber / Carlotta, Blu-ray+DVD) – This was my cinematic Holy Grail for years, Jacques Rivette’s legendary 12-hour-plus epic of rival theater companies, an obsessive panhandler, a mercenary street thief, an obscure conspiracy, the post-1968 culture of Paris, puzzles, mysteries, creative improvisation, and the theater of life. The history is too complicated to go into here (check out my review at Parallax View) but apart from periodic special screenings it was impossible to see until a digital restoration in 2015 followed by a limited American release in theaters, streaming access, and finally an amazing Blu-ray+DVD box set featuring both the complete version (Noli me tangere, 1971 / 1989) and the shorter Out 1: Spectre (1974), designed for a theatrical release after French TV balked at his original vision. It was shot on 16mm on the streets with a minimal crew and in a collaborative spirit, incorporating improvisations and accidents and morphing along the way. The disc release embraces the texture of its making and also includes the new documentary “The Mysteries of Paris: Jacques Rivette’s Out 1 Revisited” and an accompanying 120 page bilingual booklet. There were more lavish sets and more beautiful restorations on 2016 home video, but nothing as unique and committed as this cinematic event, which made its American home video debut over 40 years after its first showing. Full review here. Keith Baxter was a struggling young Welsh actor when Orson Welles tapped him to play Prince Hal in the 1960 stage production of Chimes at Midnight in Ireland. Like Welles’ earlier Five Kings, this massive production brought together elements of numerous Shakespeare plays, in particular Henry IV Part I and Henry IV Part II, to chronicle the education of a king, and like the earlier production is was commercial failure. But Welles was still determined to make his production. As Baxter related in a 1988 interview, “on the last night, coming back to England, he [Welles] said to me on the ship, ‘This is only a rehearsal for the movie, Keith, and I’ll never make it unless you play Hal in that, too.’” Welles was true to his word and Baxter, in his first major screen role, starred opposite Welles in a cast that included John Gielgud, Jeanne Moreau and Margaret Rutherford. Mr. Baxter, now eighty-two years old and a grand old man of British and American theater, was in New York City to introduce the American debut of the new restoration if Chimes at Midnight on Friday, January 8. Before the event, he granted a few interviews. “Ask me whatever you want to ask,” he said with a bright enthusiasm as our phone conversation began. Sean Axmaker: You starred as Prince Hal in the 1960 stage production of Chimes at Midnight with Orson Welles in Ireland. You were the only member of that production (besides Welles) to appear in the film. 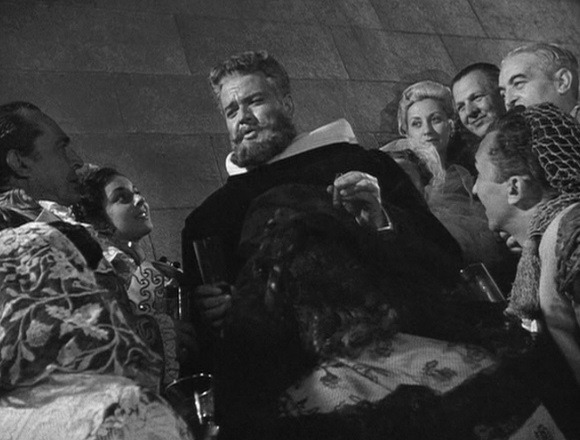 Was there any change in the way that you played Hal and in the relationship between Hal and Welles’ Falstaff between the stage production and the film a few years later? Keith Baxter: Well not really, you know. The thing is that Welles discovered me when I was out of work, washing dishes, so it was a wonderful opportunity to play on the stage with him. And, how can I explain? He really loved me and I really loved him. I don’t mean in any sexual sense. I mean because he’d given me a whole opportunity to play a wonderful part with a great actor instead of washing dishes and being out of work. So of course I felt a tremendous debt towards him. And he was wonderful to act with. He didn’t direct the play in Dublin, it was directed by an old friend of his who had discovered him when he was a teenager in Ireland [ed. note: Hilton Edwards]. Because when we started rehearsing Welles wasn’t there for two weeks, he was in Paris working on his film of The Trial, so we rehearsed without him and then he arrived. And of course we were all mightily… not in awe of him, well yes, in awe of him, whatever, and it was quite clear that he liked acting with me and I was a source of light. The legend of Orson Welles looms so large it overtakes the man, a legend partly engineered by Welles himself from his beginnings in the theater. Welles was the enfant terrible of Broadway, the Depression-era hope of American Theater, the radical genius of radio. He came to Hollywood in grand style and on his own terms, a display of egotism so great that the Hollywood establishment turned up its nose and waited for his comeuppance. And he got it three times filled and running over, as far as they are concerned. Welles completed only fourteen features in his lifetime, five of them Hollywood productions (it’s hard to consider the Republic-backed Macbeth, 1948, a studio film) and only one of those, Citizen Kane (1941), completed to Welles’ satisfaction and released in its intended form. It has been so longed hailed as “the greatest film ever made” (Sight and Sound and American Film Institute polls made it official for a time) that it’s become a dry truism. Along with its creator (and let’s face it, Pauline Kael was simply wrong: this is Welles’ creation), the legends surrounding the film have long overshadowed the actual production. Above all, Welles was a showman and Citizen Kane a three ring circus of cinematic ingenuity, a startlingly entertaining blend of dime store melodrama, historical biography, detective story, political drama, storytelling confabulation and plain old theatrical flourish. It has a cinematic brio and love of expressive possibilities that you rarely see from directors coming to the movies from the stage, but it also is a terrific piece of storytelling. Welles brought an understanding of power of sound design from the radio and applied a sophisticated, layered soundtrack and a pioneering piece of dramatic composition by Bernard Herrmann for the score. Stunningly designed to appear bigger and more lavish than its budget would support, brilliantly lit and shot by Gregg Toland with a creative invention that pushed the envelope of motion picture photography, Citizen Kane is a vital, exciting moment of American cinema brought back to life with every viewing. The legend of Orson Welles looms so large it overtakes the man, a legend partly engineered by Welles himself from his beginnings in the theater. Welles was the enfant terrible of Broadway, the depression-era hope American Theater, the radical genius of radio. He came to Hollywood in grand style and on his own terms, a display of egotism so great that the Hollywood establishment turned up its nose and waited for his comeuppance. And he got it three times filled and running over. 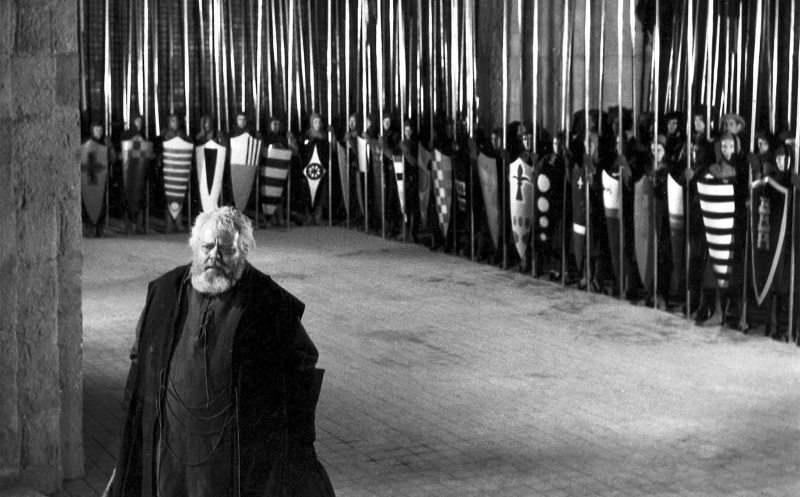 Welles finished only 14 features in his lifetime, five of them Hollywood productions (it’s hard to consider the Republic backed Macbeth, 1948, a studio film) and only one of those, Citizen Kane, (1941) completed and released in its intended form. It’s has been so longed hailed as “the greatest film ever made” that’s it’s become a dry truism. With the AFI imprimatur stamped like some official seal, its reputation is in serious danger of becoming the least seen masterpiece around, and with its creator (and let’s face it, Pauline Kael was simply wrong: this is Welles’ creation) the legends surrounding the film have long overshadowed the actual production. Above all, Welles was a showman and Citizen Kane a three ring circus of cinematic ingenuity, a startlingly entertaining blend of dime store melodrama, historical biography, detective story, political drama, storytelling confabulation, and plain old theatrical flourish. Years ahead of its time in its layered use of sound and score (a pioneering piece of dramatic composition by Bernard Herrmann), stunningly designed, and brilliantly shot by Gregg Toland with a creative invention that pushed the envelope of motion picture photography, Citizen Kane is a vital, exciting moment of American cinema brought back to life with every viewing.